In March of 1958, scientist Charles Keeling began monitoring atmospheric carbon dioxide levels at the Scripps Institution of Oceanography at the behest of then-director Roger Revelle. Two years later, Keeling became the first to alert the world to the hazard of alarming increases in atmospheric carbon dioxide, laying the blame at the combustion of fossil fuels. Since then, UC San Diego and SIO have been at the forefront of climate change research; just this month, a new model from SIO demonstrated the link between rising greenhouse gas emissions and the declining circulation of water in the Atlantic Ocean. With President Trump’s promise to eliminate $14 billion of federal funding for climate change research, this tradition of giving students opportunities to grow through hands-research under the best minds in the world, opportunities like the Keeling and the Atlantic circulation projects, is put at risk. 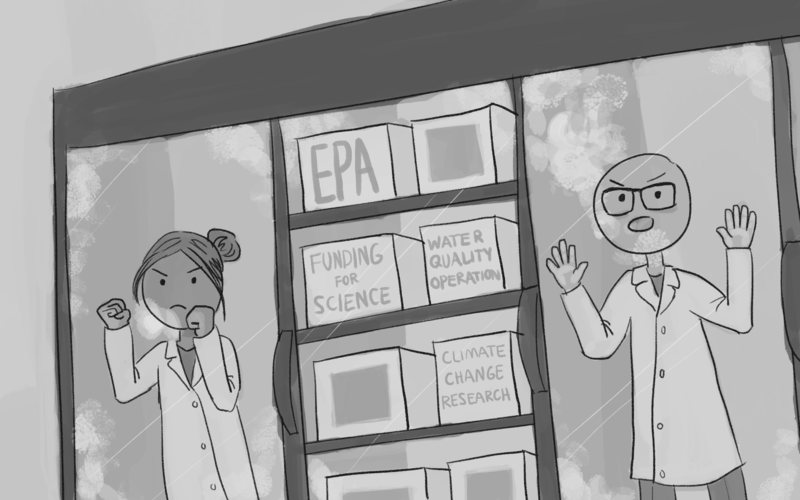 Most alarmingly, cuts to climate change research are only the tip of the iceberg. Last year, UCSD and SIO spent a combined $1.3 billion on total research, 58 percent of which came from federal agencies. The Department of Energy, whose new secretary once called climate change science a “contrived, phony mess,” funds both the Keeling project and the SIO model. The National Institute of Health, which Trump has judged as “terrible,” contributed $365 million to UCSD’s 2016 research budget. Gutting these institutions and defunding long-term fields of study simply because they are not squarely within his populist parameters is short-sighted and downright negligent. Among the casualties of Trump’s agenda are women’s reproductive health and green energy development, major fields that require continuous scientific contributions in order to have any chance at producing results that the country needs to remain competitive. To make matters worse, UCSD lacks the financial resources to make up for any reductions in government support. UCSD may be ranked eighth in terms of federal research dollars, but its competitors all have endowments in the billions of dollars and deep-pocketed alumni networks that can guarantee continued funding for at-risk projects; UCSD, due in part to its relative youth, has a comparatively paltry $600 million endowment and a burgeoning but still fledgling development arm. UCSD simply does not have the capability to solicit the private donations that have poured into now-federally blacklisted organizations like National Public Radio and Planned Parenthood, meaning that cuts to research are inevitable. Research is the lifeblood of STEM-heavy institutions like UCSD, without which they are unable able to secure the best and brightest leaders in their given fields from competitors. The doctoral candidates and professors who undertake the projects that make UCSD one of the premier research universities in the world will have no choice but to seek out better-funded schools in order to continue their research, leaving students without the basic opportunities they need to gain experience, make connections, and start their careers. This will only grow the disparity between public and private universities: those with the resources to weather politically-induced shortfalls versus those more vulnerably dependent on the federal government. Trump promised to “Make America Great Again,” to rebuild the public institutions that have nurtured American growth and security since the end of the second world war, but his actions will only have the effect of hollowing out the very institutions he has sworn to protect. By fiat of executive orders, by the power of the purse provisioned by the Republican-led Congress, he has successively moved to grow private education from kindergarten through the university level- first through his preference for school vouchers and now through his defunding of public universities. To give all people the opportunity to succeed, they must have equal access to institutions that can provide the basic skills they need to participate in the modern labor force. Public institutions are often the only financially feasible options for the vast majority of Americans and have traditionally been able to compete with the best of private universities, but should federal research dollars continue to evaporate, core establishments of the meritocracy and accessibility on which public universities were principled will continue to erode, leaving behind the would-be Nobel Laureates and captains of industry who would move our country forward.